A Navy hospital corpsman who faced heavy fire to save an injured Marine was presented with the military’s third highest decoration for valor, the Silver Star, at Camp Pendleton Friday. 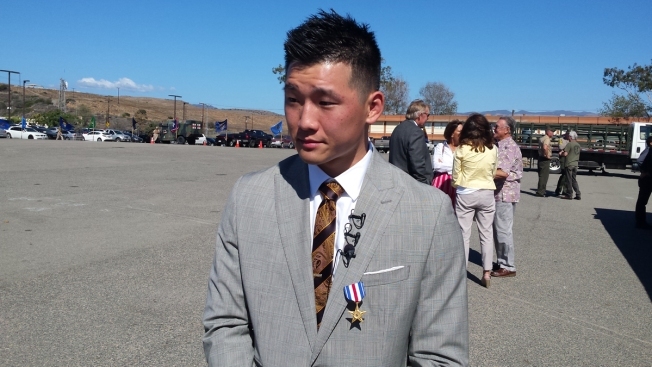 Petty Officer 2nd Class Jonathan Kong, now a pre-med student, was serving in the Sangin District of Afghanistan on June 13, 2011 when he and fellow service members came under attack during a battalion clearing operation – just two hours into a four-day operation. Kong saw Marine Cpl. Michael Dawers from a shot to the chest, so braving a hail of bullets, Kong rushed from his covered position into the kill zone to reach the man. “You get so close to the them. It’s a bond you just can’t describe in words," Kong said. "People tell me I was brave and courageous but ultimately, I wasn’t even thinking." Kong fired back at the enemy, stood up in the line of fire and pulled the injured service member to safety. “On that June morning, Doc Kong reacted instinctively and did something very few perhaps would have done,” said Marine Maj. Gen. Lawrence Nicholson. Kong then treated Dawers for his injuries and provided vital information about the enemy’s position, Navy officials say. Dawers survived. Kong looked at his fellow service members and said he knew they would do the same thing in his place. Serving in the Navy since 2007, Kong, a San Jose native, deactivated from active duty and now studies medicine at Stanford. In addition to the Silver Star, his awards include the Navy Good Conduct Medal, Combat Action Ribbon and the Navy and Marine Corps Achievement Medal.